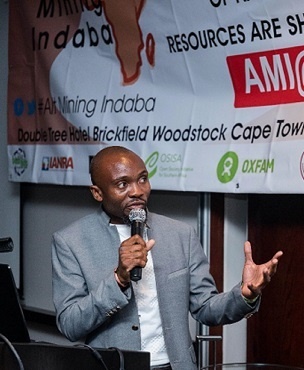 Felix Ngosa, chairperson of the committee organising the Alternative Mining Indaba, speaking at the 10th anniversary of the event on Monday. "So we started AMI – to have a space to bring communities and other stakeholders of society to raise their voice of the issues that surround the people and the communities that are affected and impacted by mining. "The other side (Mining Indaba) was a business conversation," he said. "We want to be consulted, we want our voice to be put on the table," he said. 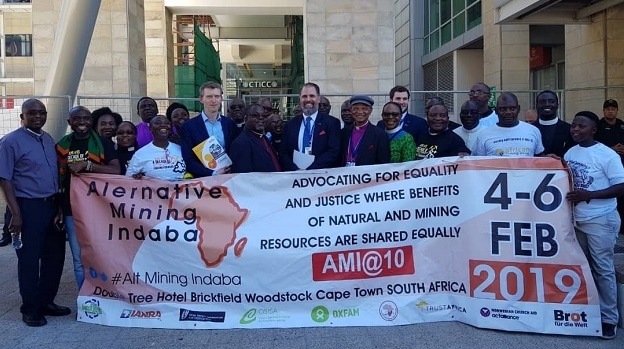 "One of our participants, a civil society leader, is speaking with those mining companies to raise their voice at the Mining Indaba, and remind people it is not just about profit. "It is about human dignity, and the livelihood of the community. It is about the life of a human being," he said. "We should not just think of profit always." "There has been progressive movement in terms of putting in place laws to do with taxation, environment and management of industry. We see a bit of a lapse [in] implementation," he said. At each AMI, a declaration is drawn up, and delegates march to the Mining Indaba where their demands are handed over. Ngosa said for seven years, the organisers of the Mining Indaba didn't collect their list of demands, but there was a breakthrough three years ago. "For the past three years, we have been able to deliver our declarations to various stakeholders," he said. Following the event, the various NGOs will continue engaging with various stakeholders in mining, including the Southern African Development Community and the African Union - with the hopes of participating in shaping the vision for African mining.